Your Right to Opt Out of Information Sharing Under FCRA | The Consumer Law Group, P.C. If you have good credit—and in some cases, even if you don’t—you probably get several letters a week offering you a credit card or an insurance policy. These offers claim that you have been pre-approved or pre-screened for the offer. How are they getting this information? Is there a way to stop it? The creditor or insurer establishes criteria, like a minimum credit score, and asks a consumer reporting company for a list of people in the company's database who meet the criteria. The creditor or insurer provides a list of potential customers to a consumer reporting company and asks the company to identify people on the list who meet certain criteria. When one of these companies seeks your information, your account will show that there has been an “inquiry,” but this inquiry will not have a negative impact on your credit rating. These companies are within their rights to request this information, but you also have the right to opt out of sharing your credit score via such inquiries. 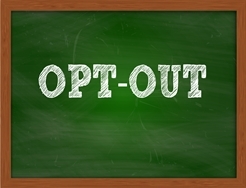 If you do not want to receive pre-approved offers from credit card companies or insurance providers, you can opt out for a period of five years or you can opt out of these offers permanently. For either option, visit the website optoutprescreen.com for further instructions. Opting out through this website will take care of the three major credit reporting agencies, Experian, Equifax, and TransUnion. While the piles of unsolicited mail may be annoying, if you are in the market for a credit card, you may not want to opt out of prescreened offers. Prescreened offers tell you what is available, and allow you to compare costs and find the best product for your needs. Some credit card or insurance products may only be available through prescreened offers, so opting out could limit your access to good rates and cards with valuable benefits. Creditors and insurers can legally access your credit score to offer you products. However, when someone else gets ahold of private credit information and uses it to steal your identity or apply for a card in your name, or use it without your permission to refuse employment to you, you may need to take legal action. If your credit information has been abused, fill out the form on this page to see if the attorneys at The Consumer Law Group, P.C. can help.